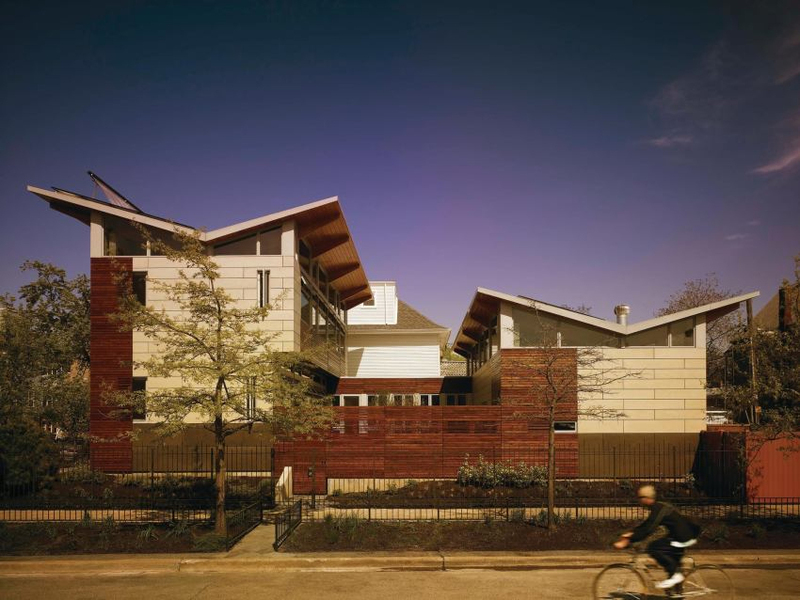 A smart, exuberant design shows that homes can be net-zero even in Chicago. 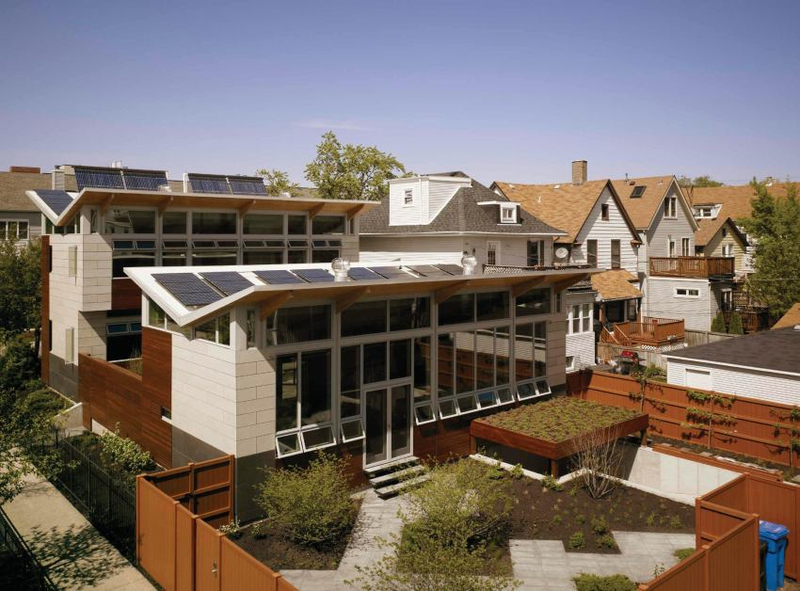 “On a day like today, when the sun is streaming in through the south-facing windows, it’s a great feeling to know the solar panels on the roof are sending energy to my neighbors’ houses,” says Michael Yannell, owner of the Midwest’s first net-zero-energy house—the first in Chicago to earn LEED-Platinum certification and one of the highest-scoring LEED for Homes projects to date. 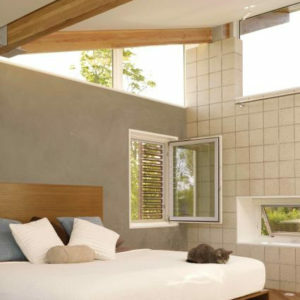 When he contemplated building back in 2006, Yannell was determined to have the most energy-efficient house possible. But it was also to be a statement challenging the wasteful McMansions popping up in Chicago’s pre-crash economy. “I thought, ‘We have all these off-the-shelf green products, and no one seems to be using them in Chicago. Someone needs to set an example of what can be done here,’” he says. 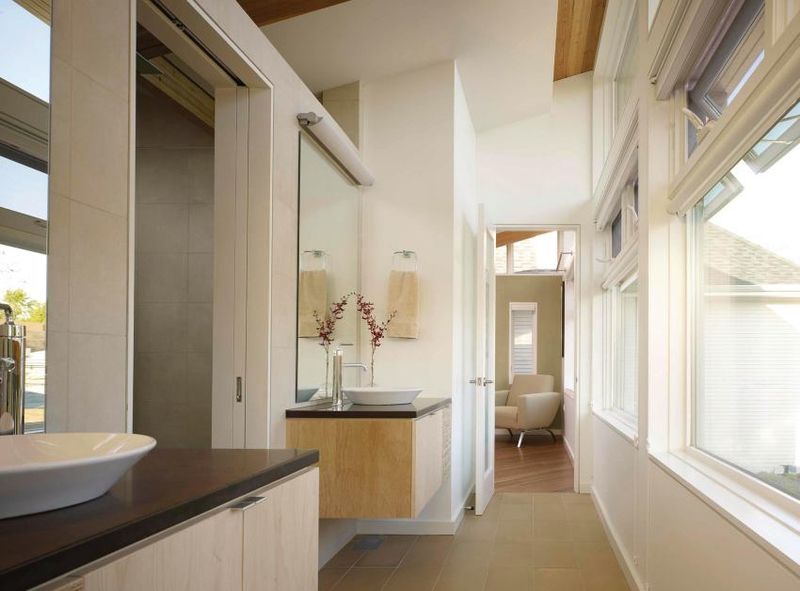 Farr Associates in Chicago helped him do it elegantly. The team’s design focused on combining passive solar strategies with photovoltaics and symbiotic mechanical systems that share excess energy among themselves. Positioned at the center of the 50-foot-by-100-foot urban infill lot, the U-shaped building has two east-west–oriented wings, joined by a foyer, that face each other across a courtyard. 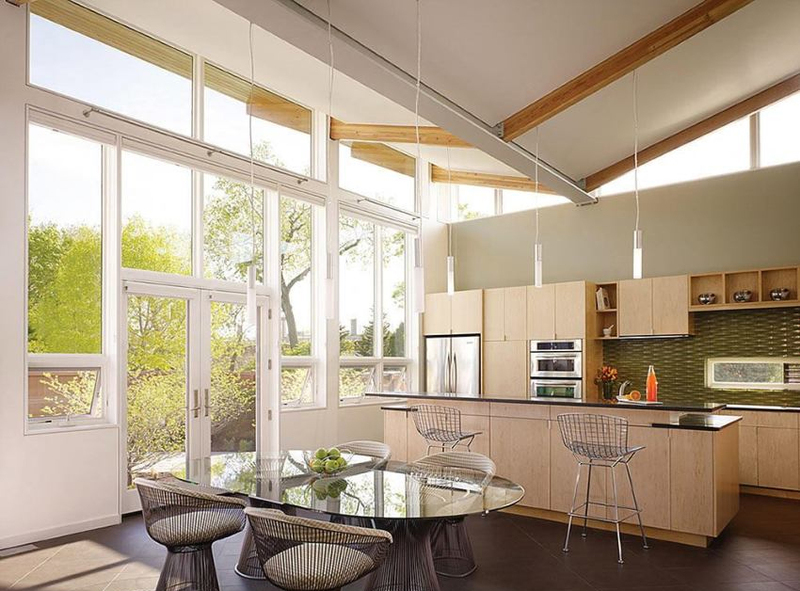 Each narrow wing has a wall of triple-pane windows on the south face, so that all the living spaces are daylit for 80% of all daylighting hours. 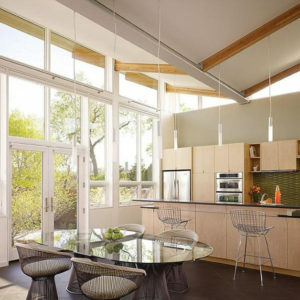 “To get to net-zero, you have to save every ounce of energy you can,” says Farr Associates principal Jonathan Boyer, AIA. 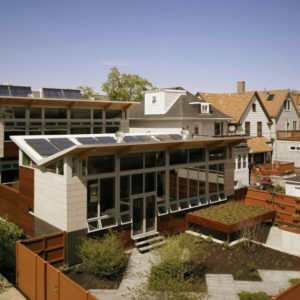 “You’re asking, over and over, ‘How can we make everything we do have at least two functions?’” Augmenting the 48 solar electric panels, which are cleverly hidden from street view on the butterfly roofs, are three closed-loop geothermal wells attached to a water- and air-side heat pump that warms the radiant floors and heats and cools the forced air. Additionally, the excess heat produced by four solar thermal evacuated-tube panels (beyond what’s needed to supply the household with hot water) boosts the geothermal system via a heat exchanger. To reduce the energy load on the building, the north walls have an 8-inch-thick interior cement-block wall with a 6-inch plenum behind it. A fan draws heated or cooled air along the inside of the thermal mass wall and into the basement, where it passes through an energy recovery ventilator and is recirculated. 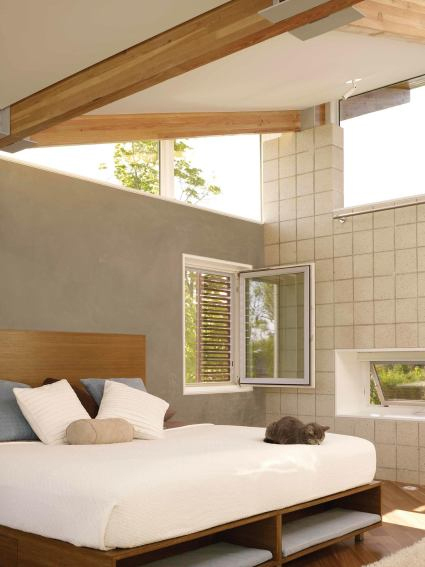 In short, air is constantly being tumbled through the house, heating or cooling the wall, which both keeps the house comfortable by reducing temperature swings and saves energy.